California water agencies have been tasked to make water conservation a California way of life to help mitigate future droughts. 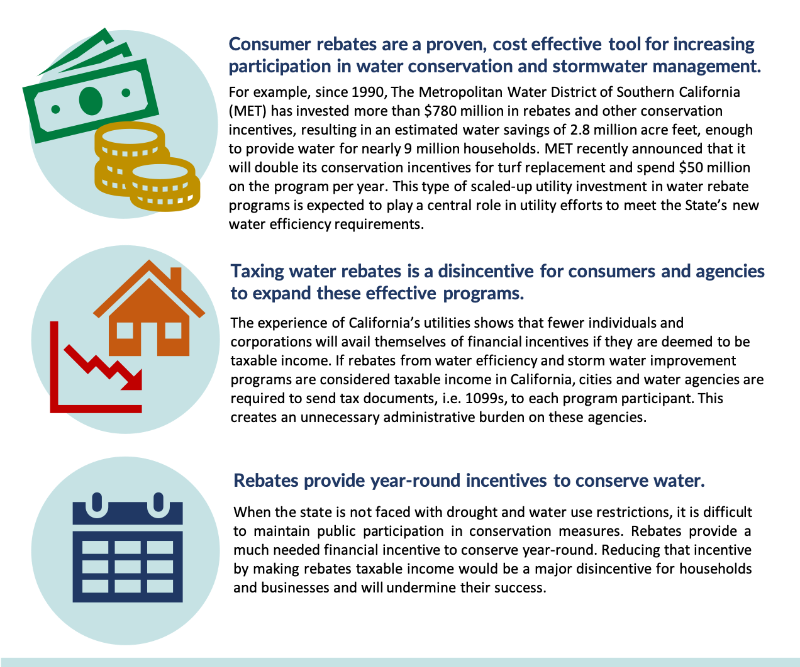 This means increasing consumer rebate programs that save water year round. AB 533 would exempt from state income tax any rebates, vouchers or other financial incentives issued by a local water agency for participation in water efficiency or storm water runoff improvement programs. An exemption is necessary to develop and expand these proven water-saving programs. While CalWEP and the Alliance for Water Efficiency, along with our partners, simultaneously work to pass a similar tax exemption bill on the federal level, AB 533 will send a strong signal from California and is an important step in the overall effort to ensure that agencies who administer these rebate programs avoid having to issue burdensome 1099 tax forms to participating customers. Please consider sending a letter of support for AB 533. For more information, download the fact sheet and feel free to use and personalize this sample letter. Please contact Tia Lebherz ([email protected]) to confirm your participation in this effort for our tracking purposes! As part of its 2018-2020 Strategic Plan and in response to the 2018 Listening Tour, CalWEP will participate in selective advocacy efforts that directly benefit members and support their urban water efficiency efforts.